Toiling in the basement of his Newton home in the 1980s, virtual reality pioneer Eric M. Howlett solved a key problem in the quest to experience far-flung and potentially dangerous places without ever leaving a comfortable chair. He developed special optics offering the kind of wide-angle peripheral vision essential to making viewers feel as if they were experiencing a place and not just looking at a picture. “He was one of the smartest people I’ve ever met. Anyone who has ever seen one of his wide-angle views realized he was on to something,’’ said his friend and former business partner Thomas G. Hagan, who met him at MIT in the late 1940s when they were fraternity brothers. 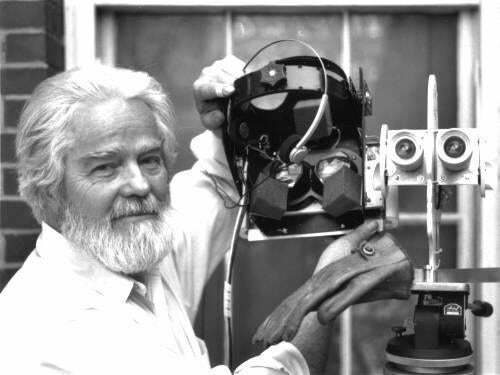 Mr. Howlett, whose Large Expanse Extra Perspective or LEEP system was purchased by NASA and Disney but never widely produced, died of cancer Dec. 11 at his home in Acton. He was 84. A 1949 graduate of MIT, Mr. Howlett was remembered as a fiercely independent, brilliant inventor who poured all of his resources into LEEP. He secured a patent in 1983, but his invention was ultimately rejected by Kodak and Polaroid. The patent has since expired. He tried to manufacture the product himself with a small staff working out of the Waltham Watch Factory in the 1980s, but they were unable to deliver on scores of orders. “It was just too hard to do, and the money ran out,’’ said photographer Ulrich Figge, who worked for Mr. Howlett for several years and helped build components for LEEP. Yet, Mr. Howlett never fell into despair, according to his friends and family. Her father enjoyed sharing science with her even when she was too young to understand his tutorials on topics such as the electromagnetic spectrum of light. “When I was little, I asked him why the sky is blue, and he told me,’’ she said. With his white hair and full white beard, he was a charismatic presence in technology circles around Boston. He spoke at numerous conferences about the promise of virtual reality and could be quite stubborn about his ideas, according to Figge, who now lives in New Salem, N.Y.
“How can you get annoyed with somebody who looks like God,’’ one virtual reality enthusiast once observed after a talk by Mr. Howlett, Figge said. Born in Miami, Mr. Howlett’s mother and father divorced when he was a baby. His mother, Margaret Gardner Mayorga, who began and edited a series of books called “One-Act Plays by American Authors,’’ raised him in New York. As a senior in high school, he was one of 40 students chosen nationwide for the Westinghouse Science Talent Search. The award came with a trip to the White House, where he met Eleanor Roosevelt in 1944. Grumman Aircraft awarded him a full scholarship to any university. He chose MIT. He earned his degree in physics after a stint in the Navy. Mr. Howlett married an art student he met in the 1940s, named Mildred “Billie.’’ They divorced after 20 years of marriage, and she later died. He worked for MIT’s Lincoln Laboratory in the 1950s and later for General Electric building electrical systems and early warning radar for the military. In the 1960s, he went to work for Adage Inc., which was cofounded by Hagan, and became director of research. He later launched several companies of his own, did consulting, and worked on other inventions including a chemical he called “Bottled Weather’’ that would give surfaces a weather-beaten appearance. Mr. Howlett met his second wife, Joan Houlihan, in the 1970s when she rented a room from him in Newton. She is now director of the Concord Poetry Center, founded in 2004. “He had so much interest and curiosity in everything, and a kind of fearlessness about the world,’’ she said. “He was very open-minded and humanistic. He was warm, very kind and generous.’’ They were married 30 years and had twin sons. In recent years, Mr. Howlett developed a LEEP-head mounted display he called Cyberface, promising viewers a 360-degree view and full sound. His son Alex, a computer applications developer, has tried to market the system for gamers. Working on LEEP helped bridge the generation gap between them, said Alex, whose father was 57 when he was born. In addition to his wife, his daughter, and son Alex, Mr. Howlett leaves another son, Ian of Acton. A memorial has been held. Burial will be private. J.M. Lawrence can be reached at jmlawrence@me.com@globe.com.